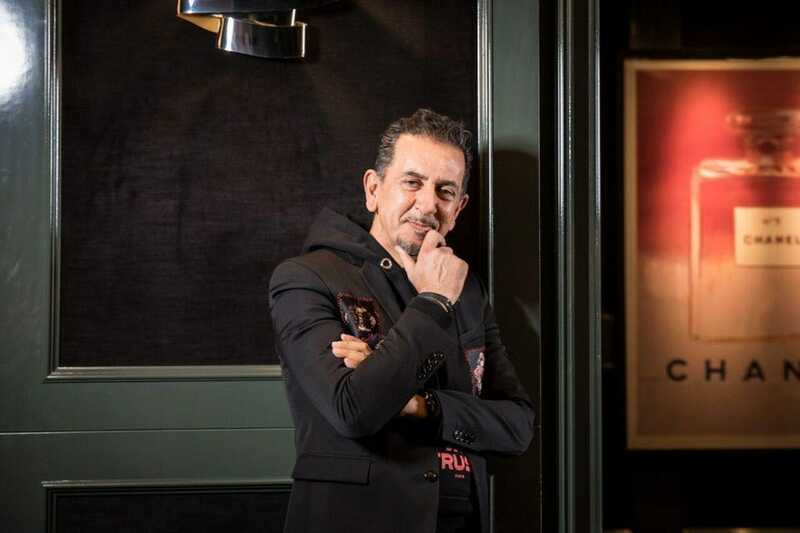 “Just give me half a can of Red Bull” Charles Khabouth – CEO of Ink Entertainment, says decisively to the waiter. For a man who has amassed a lifestyle-entertainment empire (including over 15 restaurants) and 35 years in business, ironically – he tells me that “I hardly ever do lunch”. It’s approaching 1pm and the power-packed sip will be the first thing he’s had all day. Typically, he has no time for leisurely-lounging lunches, so I need to make haste during our hour-long meal and chat. We’re seated at a high-top nestled in a corner nook of Kōst, one of his new hotspots that offers weekday lunches and sociable dinners. Amongst the cacophony of chatter within the popular outpost, the restaurant’s panoramic rooftop views of Toronto’s downtown core offer a welcome respite from the busy flurry of surrounding activities. Already, the space reflects Khabouth’s charms and charisma – in two words – eloquently eclectic. Kōst is situated on the 44th floor of his new boutique property, the Bisha Hotel & Residences, whose rooms and lobby oozes seductive moodiness – and then starkly contrasted by Kōst’s Baja Peninsula-beautified dishes and lofty digs; but somehow, the design divergence works. 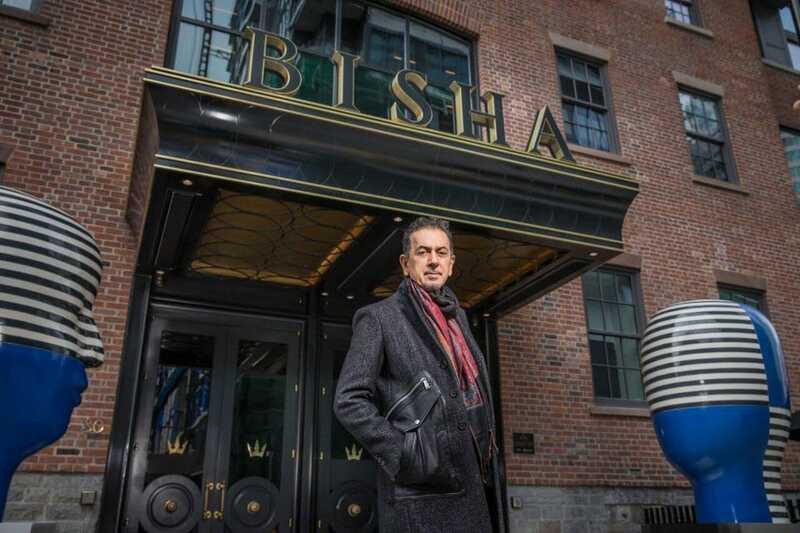 Charles Khabouth outside of Bisha Hotel & Residences. Charles Khabouth outside Kōst’s patio/pool. This attention to finer details help facilitate smooth day-to-day operations but in a notoriously volatile and risky industry where the next new and shiny thing can poach your prime audience from you – for Khabouth, it’s imperative to lay down solid groundwork to maintain loyalty and longevity – which includes consistency (in service, style, quality) with a touch of those necessary off-the-cuff components to keep interest levels piqued. 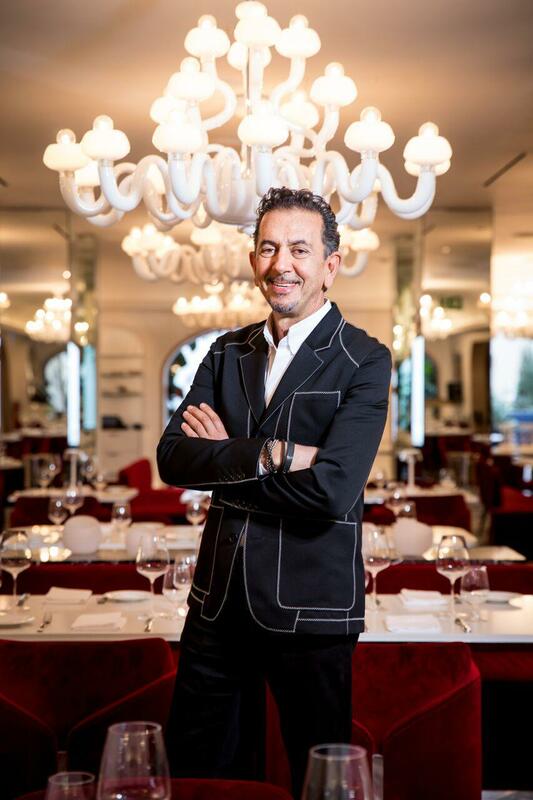 It’s the reason why he succeeded with Byblos, his first restaurant venture outside the country in Miami by offering diners vibrant Eastern Mediterranean cuisine & cocktails, along with Insta-worthy decor and a forever golden-goddess-suntan state of mind. Despite having an awareness that the failure rate was an astonishing 80%, with these elements at play, he confidently opted to be his own entity rather than go down the “safe route” and align with local partnerships – and the calculated risk paid off. “By nature, I’m an out-of-the box kind of guy,” he explains. Which leads us to chatting about his sartorial style, which I could already attain a sense of because many of his professional pursuits have been influenced by his appreciation and admiration for this influential art-form and craft. It takes a lot of gusto and conviction for someone as high profile as Khabouth to not work with any stylists. But perhaps such a decisive demeanor stemmed from the need to be mature at an accelerated pace. He was barely 15 when he came to Canada on his own and as he puts it, “I had to grow up fast. So in that regard, I’ve always been self-taught and comfortable in my own skin… I just needed to ‘figure it all out’ quickly. To survive and thrive, I had to differentiate myself from the rest.” Fashion was one of these initial outlets of self-expression. This maturity lead him to own a boutique clothing shop on Queen West (a chic and indie fashion area) just before he reached 20 years of age. He soon realized it would take a bit more time to carve out a space and name for himself so he opted to transition into the nightclub/festivals circuit, that paved the way to restaurants, and eventually hotels. And yet, with every brand, festival and property – he ensures that each one is a stylish and beautiful masterpiece -everything from the decor, the silverware, down to the staff outfits. Charles Khabouth inside Mister C lobby bar, Bisha Hotel & Residences. Speaking of outfits, I observe his predilection for wearing everything in a midnight hue. For Khabouth, he says that black is consistent, chic and sophisticated. “I have only and always worn black. I’m comfortable in it. Sometimes I’ll make an exception for that odd white shirt and a few dark colors, but aside from that, it’s black all the way.” Moreover, Khabouth says that it sends a message when one enters a room and it allows him to be experimental with more “loud/statement” pieces that would otherwise be deemed over-the-top if worn in any other color. And then there are the details that warrant a double take. I note this when I see the black Rick Owens blazer he’s wearing during our lunch with subtle fringe finish. He grins knowingly. Of course, it’s intentional. Upon another glance (which he knows you’ll do), you’ll be struck by his choice of fabric, cut, fit and those intimate flourishes – all of which speak volumes in term of Khabouth’s confidence and ability to turn heads as well as get people talking. It’s precisely this strategy he adapts to his line of work – knowing just how far to push the boundaries. “Clothes certainly set the tone but they don’t define who you are. That’s up to you.” In what could be perceived as a perfectly timed life-coaching moment, he pauses reflectively and adds, “don’t go overboard, but still be outstanding”. Charles Khabouth inside his office. It explains why every property, even nightclubs, are given their due attention to details and design features. 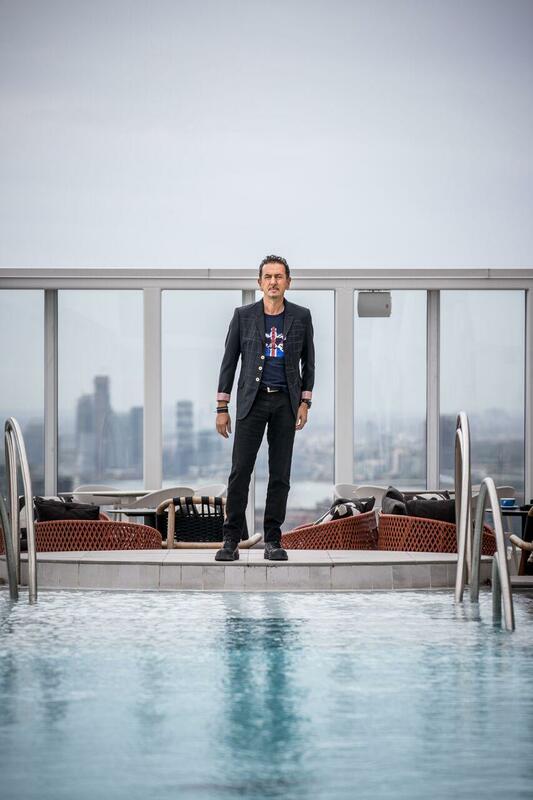 When Khabouth wanted to first make his mark on the club scene in the 80s, he did so in style – making a name for himself with Stilife, by commissioning then “rising-star” designers Yabu Pushelberg to work on the interior. Instantly, it became the definitive hot-spot to be seen and heard. And more recently, he’s achieved the same level of buzz with Sofia – a sultry Italian restaurant located in the swanky confines of Toronto’s Yorkville neighborhood. If Sofia was a Charles Khabouth ensemble – the velvet rouge furnishing, white chandeliers, and curated fine art- would be the fanciful frills and the “foundational black hue” would be the consistent informed service and sumptuous Italian fare. ← What Are The Signs Of High Blood Pressure?